It would be great if they brought out a 690. That would probably be my weapon of choice. I switched from the 690 R (with mods), which I used for single or multi-day adventures, to the 990 ADV (with mods) for the comfort, and I would not go back. The extra weight means the bike absorbs the rough terrain, rather than the rider, and while it can get tiring lifting her back up after a fall, I avoid falling more than a couple of times a day. The mono also vibrates more, despite what anyone may say about the improvements to reduce vibrations. I can now ride for 8 - 12 hrs/day without hand or bum numbness, and in most situations ride just as fast off road because the suspension is working out, not me. Now, if they brought out a 800 ADV twin at 180kg dry with 25+ L fuel, I'd buy one without a second thought. That sounds like the 800GS, but I mean built tough (KTM style) with a real off-road attitude. I think it will be a 800cc parallel twin from what early reports say. I can't see why they can't adapt the 690r into an adventure configuration. I'm hoping to aquire a 701 husq. and adventurize it. First order of business would be to put a Brittania Comp. windscreen on it. Wow! That's really exciting! Can't wait to see how it's completely set up! Certainly fantastic times for the KTM/HUSQ brands and everyone that enjoys exploration by two wheels ! Even though I'm older , I'm more excited about motorcycling now than when I was much younger. KTM is really uping the ante in the motorcycle manufacture world. 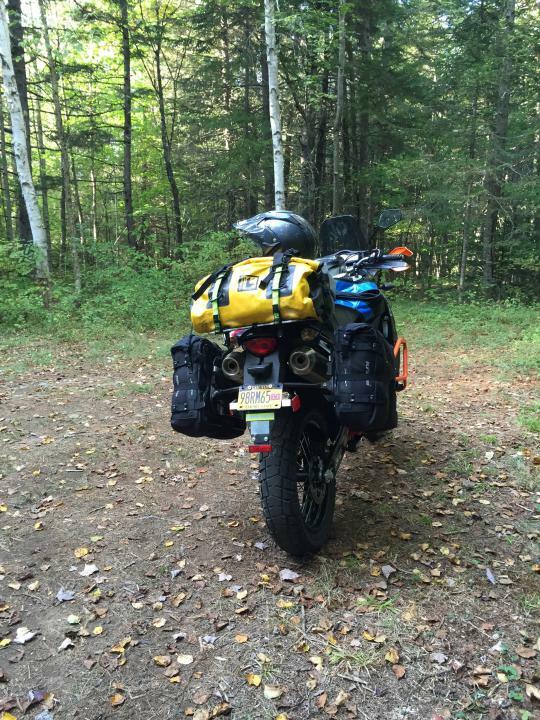 I'm building my own 690 adventure model for those trips that riding the GSA is just too much. The more that I ride the 690, the more that I absolutely love that bike. Exactly what I'm hoping to do with a 690 or 701 hopefully ! Is a Brittania Composites fairing in your plans? What do you love not love about your 690? I'm hoping by the time I buy one they'll have made more improvements. What kind of improvements are you hoping they make? I love this bike. A lot. I also ride a BMW GSA and swapping between the two bikes is very welcome. I appreciate the simplicity of the 690 compared to the GSA. I'm actually more comfortable on the 690 with the Seat Concepts seat now than I am on my GSA with the brick Touratech seat. (biggest waste of money I've ever spent). Now that I've got the fairing on the 690, it's gotten even easier to just cruise on the bike since I'm not getting pounded with highway speed winds in my chest. If reliability doesn't become an issue, I can very easily see the 690 becoming my main bike for some really big trips. To each their own though. Bikes that I love, others hate, and vice versa. Enjoy your thumpers, i read that the Japanese might be dropping the big thumpers all together due to difficulty meeting current emissions standards. @GSA.007- Exactly! Like the diversity of choosing between a single, like my KLR , and my 990-R , a real performer. Just saying theirs usually room for improvement no matter how small after a first edition. I do have this attachment to the KLR but I do want a single with more performance and adventure capacity. There are some nuances between the 690 and 701 as I've read. Maybe they give them better headlights, longer service interval, better seat , better subframe etc in another few years. Can't wait to get one that's for sure! @gsa.007 - very impressed with your insta. page and location! You are a very travelled rider that's making this old guy jealous! Excellent 690 too! May way of thinking! Thanks for a link to the great photos! Ride on Ride safe! The service intervals right now are at 6,000 miles on my 690. That's the same interval as on my '15 GSA 1200. It's crazy on the 690, there are three oil filters, two replaceable and one that is a coarse screen that needs cleaning each time. I have thought about it. I already have the Reckless 80 system and it fits the 690 perfectly. I'll likely get the 40 version as well for day trips. I'm picking up regular Mosko panniers for my 1200 next month and I may end up adding backer plates to the 690 as well so I can just swap the bags back and forth as needed. Doubtful though if I end up with the Reckless 40 as well. I'll likely just use the reckless setups on the 690 to keep things as simple as possible. Have previously invested in the Kriega system for my 990 and if I wind up with 690 I'll looked at setting it up for that as well. Really impressed with the Mosko products , so much already invested in Kriega , Giant Loop etc. That's the overlander 60 mounted to the oem frames. Nice setup! I have one Kriega 10 bag that I use as a tool bag on my GSA and just strap it to the pillion seat area. The straps don't stay tight and it doesn't take long for the bag to start shifting around. Hope you're have a lot better luck with their bags than I am. Well something is up! I just checked out the new line up at "KTM.com" and they do not have the 690R Adventure listed. 690 Duke Yup, 690SM Yup. Makes me think they dropped it for a year while they work on a new one? I doubt it with Husky retaining their 701. Unless a separate unveiling is coming up down the road? Maybe EICMA in Nov or next year's Intermot. I already heard it's an '18 model so I wasn't expecting to see anything until a year from now.